Win2PDF Pro can overlay an existing PDF file on newly created PDF files (Add a Watermark) or place and existing PDF file behind text and graphics on newly created PDF files (Add a Background). The existing watermark or background PDF file can contain any text or graphics, but it most often used to apply a "confidential" or "draft" stamp on each page of a document. To enable the watermark or background feature, select the "Add a Watermark" or "Add a Background" option in the Win2PDF "PDF Options" dialog. If the watermark or background PDF file contains more than one page, only the first page will be applied to each page of the new document. It's best to use a watermark or background PDF file that has the same page size as the newly created PDF file. 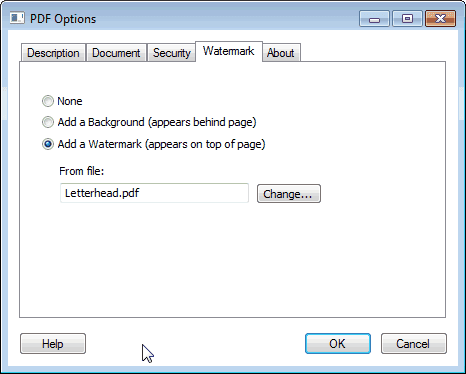 If the watermark or background file has a different page size, it will be scaled and centered on the page of the newly created PDF file. Information on controlling the watermark options from a custom application is available in "watermark options" in the developer information section.